Generator installation gives your home or business backup power for when you need it most. Your household can still have chilled groceries and modern conveniences when there’s no power. Generators also give businesses a safe and comfortable environment for employees, customers, and clients. At Bryan Electric, we partner with a leading generator manufacturer, Generac Generator. This allows us to offer our customers the highest quality in these appliances. We are here to deliver expert installation of the right generator for your setting. We choose to work with Generac Generator, a top manufacturer in the industry, because we have experienced first-hand the high quality products they offer. Our customers deserve the very best, and our partnership with Generac gives them access to the right generators to meet their residential and commercial needs. To add even more value, the Bryan team provides Generac authorized service, so your generator always works as the manufacturer intended. Our technicians are factory-trained on these products to provide an expert generator installation. Because we have access to authorized parts and literature, we will provide a correct installation and repairs—we get the job done right the first time. We can also perform routine maintenance to keep the generator working as it should. Generac Guardian Series: This series provides emergency power for homes. It offers plenty of power in a compact size. Generac QuietSource Series: This series gives extra features for larger residences or custom spaces, offering extra power while running in a quiet way. Generac Commercial Series: This series gives the backup power that businesses need. We have solutions for commercial and industrial settings, providing power that can handle large spaces and heavy use with quiet operation. Our field staff has extensive experience in sizing Generac generators and installing them. We also install transfer switches. With our professional service, we offer one of the best warranties in the business. We can offer this warranty because of our extensive experience with this brand and our ability to service what we sell. One of our helpful technicians will recommend the best generator solution for you. We have options for your residential, commercial, or industrial environment. When you choose to work with Bryan Electric, you can trust we will be upfront about our costs, offering a fast service, so you are always prepared for power outages. At Bryan Electric, we have experienced and qualified technicians ready to help you. 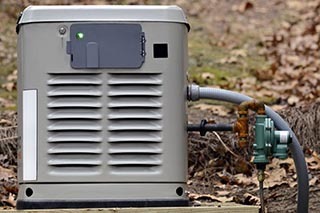 We know how to install and service a Generac generator for your home or business and will make sure your backup power source is set up in the right way, so you can rely on it when you need it. Be ready for future power outages by having us install a high-quality generator. Count on our expert technicians at Bryan Electric, Inc., to perform the installation for you. Learn more about generator installation and set up your appointment by calling (770) 680-2144.